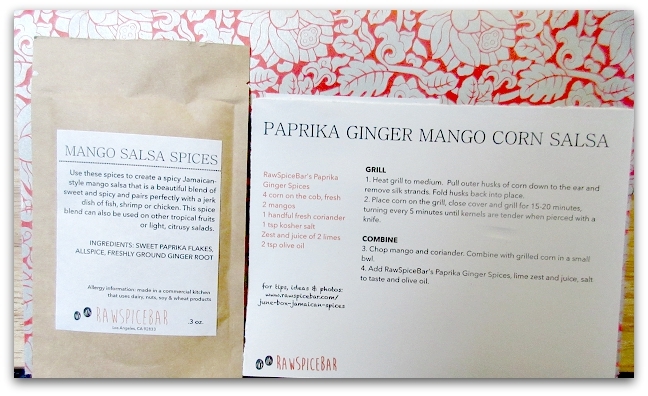 Raw Spice Bar is a subscription box that delivers spices to your door every month. 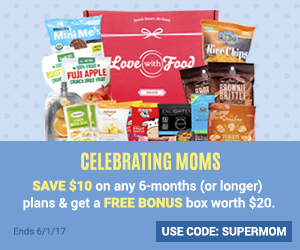 The spices are centered around a monthly theme and are made just days before being shipped out. 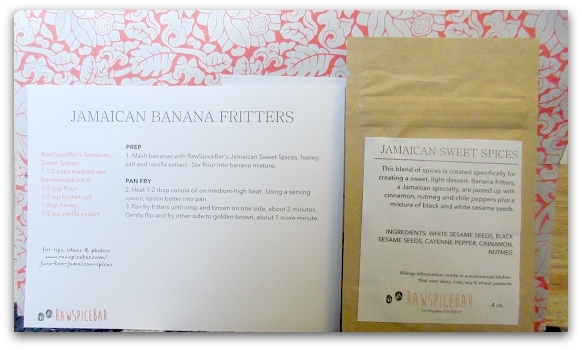 The country theme for June was Jamaica, and that definitely means some yummy jerk spices! 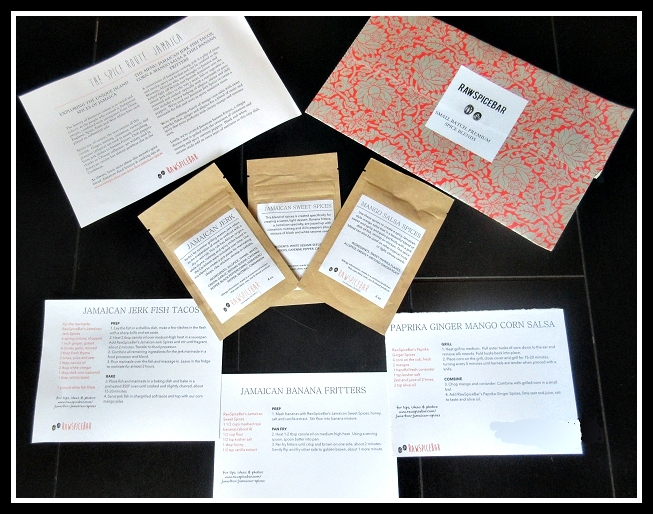 What you get: each month you receive 3 different spice blends and some information and recipes on how to use them. 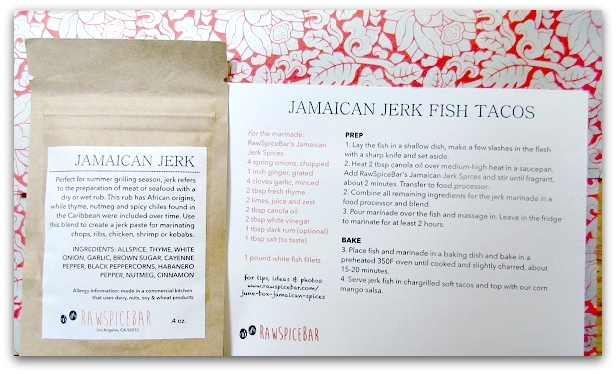 Perfect for summer grilling season, jerk refers to the preparation of meat or seafood with a wet or dry rub. This rub has African origins, while thyme, nutmeg and spicy chiles found in the Caribbean were included over time. Use this blend to create a jerk paste for marinating chops, ribs, chicken, shrimp or kebabs. Corn and Mango aren’t two things that I would ever put together but they worked really well and the salsa was delicious. 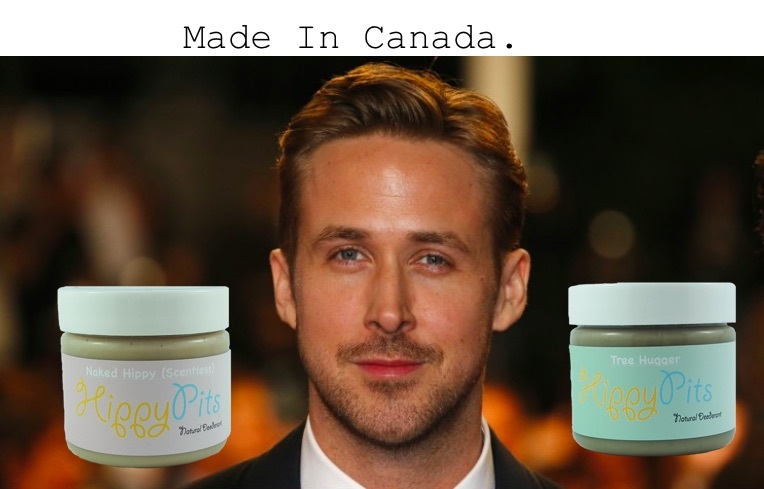 That’s the great thing about RawSpiceBar you get to try different things you wouldn’t have otherwise. Use these spices to create a spicy Jamaican style mango salsa that is a beautiful blend of sweet and spicy and pairs perfectly with a jerk dish of fish, shrimp or chicken. This spice blend can be used on other tropical fruits or light, citrusy salad. I’m not a huge banana fan, so I haven’t tried this yet. I might try to use a different fruit and make like apple or blueberry fritters instead. This blend of spices is created specifically for creating a sweet, light dessert. Banana fritters, a Jamaican specialty, are jazzed up with cinnamon, nutmeg and chile peppers plus a mixture of toasted black and white sesame seeds for a hint of nuttiness. I think the June RawSpiceBar is my favourite theme so far! I definitely will be making these dishes again. For $6/ month I really recommend this subscription, it’s an affordable and fun way to mix things up in your kitchen. What do you all think of RawSpiceBar?